I didn’t run into too many people in 2012 who were ready for the holiday season – particularly, Christmas. For most of us, it had sneakily snuck up upon us, and we weren’t ready. We pondered: where had the time gone? Then the next thing we knew, the decorative red and green reign of Christmas had already been replaced in the stores by festive purple, yellow and green – tempting Mardi Gras king cakes. Christmas had come and gone, and the next holiday was getting ready to go up to bat. And once more, we pondered: where had the time gone? In the midst of all, 2013 was becoming impatient. It was knocking at the door, waiting to come in. And we knew whether we opened the door or not, liked it or not, were ready or not, 2013 was going to step over the sill. We really had no choice in the matter. After all, we knew time waited for no one. So with arms outstretched – with arms wide open, why not just open the door and welcome 2013 in? That reminds me of Creed’s hit song, “With Arms Wide Open,” written by the band’s lead singer Scott Stapp upon finding out he was going to be a father. With arms wide open, he sang about welcoming his child into the world, and being the best he could be. Of course, that was before he auditioned as a bad boy after the song’s immense success, and began hanging out with Kid Rock. Not sure where Scott is now or what he’s doing, but I remember how much I loved his band’s song even though its radio and video plays went into overdrive at times. But I never stopped liking the song. It remains a fitting and memorable song even in 2013. Google the lyrics, and see for yourself. More than a decade has passed since the song made its debut. It just goes to show you that life goes on. And that means a new year is always beckoning – waiting at our door, waiting to come in. It also means that it’s still not too late to welcome in 2013 even though it has definitely stepped over the sill already. But let us take note, in case we didn’t get the opportunity to officially toast 2013̓s arrival, that we welcome it now with arms wide open. Most of all, we welcome the opportunities it brings. While we know not the future, we know that each year offers us opportunities – opportunities to make our dreams come true. As a matter of fact, each second that we draw in breath offers us the same. Yet we are peculiar creatures, and we like to view time in the totality of segments. Since it goes so fast, we like to view it in years, months, weeks, days. For now, we’ll set aside the minutes and seconds, and concentrate on the larger timeframes. After all, they offer us the chance to set – and break – resolutions. The other day, can’t remember where except on television, they named reading more books and losing weight among the top New Year’s resolutions for 2013. 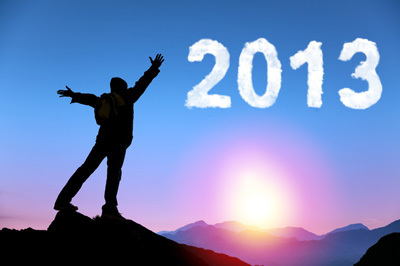 Whatever your resolutions are – whatever your dreams, your goals, your hopes, your aspirations – why not turn them over to 2013? Why not let 2013 be the year that you really put at least one into effect? The most important thing about goals, according to the experts, is not in making them but in implementing them. And according to the experts, that’s where accountability comes in. If you want to make goals, you have to become accountable in order to enforce their implementation. In other words, share your goals with others, and recruit a buddy to keep you focused. I’m sure we’d all like to hire a life coach who would work to ensure that we adhered to our aspirations, and implemented our goals so that we could rejoice in our accomplishments. For those of you who can, follow your path, and then consider helping someone else to reach theirs. For those who can’t, let’s visit our local library for books on implementing goals, or google online for advice. Wouldn’t it be nice when 2013 draws to an end and 2014 beckons at the door, we can look back and feel great that we accomplished something we’ve been dreaming about for years? That something can be as simple as clearing out a closet or a garage even though that might seem mountainous. But I bet we’d feel great afterwards. When we were little, we would have been willing to testify in court that time stood still. We would have argued such was the case: time took forever and ever and ever. Now that time seems fleeting, let’s make each moment count. Let’s vow to do all that we can so that 2013 overflows with our accomplishments. That way – when 2014 arrives, it won’t have to knock. We’ll already have the door wide open.